This is the pectin I've been using all summer to make low-sugar freezer jams from fresh blueberries, strawberries, raspberries and blackberries. I hadn't made freezer jam in many years because it used to require so much sugar and often corn syrup too to form a good gel--more sugar than fruit! 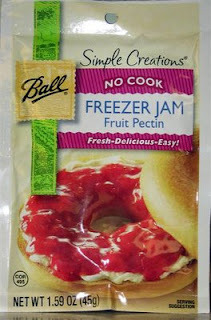 This newer pectin from Ball is not marketed as a "low-sugar" product, but it requires only 1 1/2 cups of sugar for 4 cups of crushed fruit and it sets up beautifully. It also works with Splenda, if you absolutely must avoid sugar. I used this to make the raspberry filling for my Fresh Raspberry Tarts. The process is easy enough for a child to do. You simply stir the pectin and sugar together, add the crushed fruit, stir for three minutes, ladle into jars or plastic containers, let stand 30 minutes and then freeze for up to one year or refrigerate for up to three weeks.